Two thousand years from now, some poor child in a history class is going to be presented the following three headlines from today and then asked to explain what caused to downfall of the United States of America. Folks what more can you really say? Let’s look at each of these just a bit more. The National Football League did this to themselves by allowing politics into the game. The San Francisco Forty-Niners and then the NFL Commissioner allowed this to happen much to my amazement. I watched zero NFL games last season and will watch none until this practice is outlawed. A penalty is not enough. It is a half measure from a group of spineless owners that have been given billions of taxpayer’s money for the sole purpose of playing a stupid game. The owners should have their government protected monopolies removed and be forced to seek only private funding in the future. On Wednesday, the league announced new guidelines that require players who are on the field during the anthem to stand, but allows individuals who decide to skip the “Star-Spangled Banner” to remain in the locker room. Parents can kick their 30-year-old son out of their home. The man in this story is selfish and by all accounts has failed to honor his parents. The Commandment doesn’t say honor your mother and father only when you agree with them or when they deserve it, it is not qualified by such weasel words. A verse in Proverbs comes to mind but it doesn’t really mean what you think it does. Dr. Crenshaw is a smart guy and the article that I quoted above is well worth the time to read it. 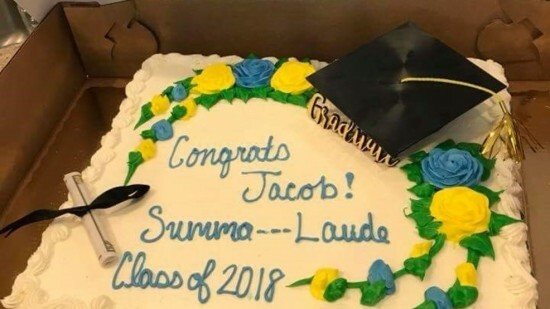 For those of you on the Left Coast, Publix is a grocery store chain which apparently has a bakery with employees that were given average publix-school educations. Since Latin is no longer taught, I’m not that surprised. Most folks now-a-days only think in terms of bodily fluids and how to satisfy their base urges. The thought of these words being associated with academic excellence is clearly beyond their comprehension. Clearly Publix employees only use that word in another context when messaging their friends on social media. So, student of the future, what did you conclude about the state of our Republic and its demise?